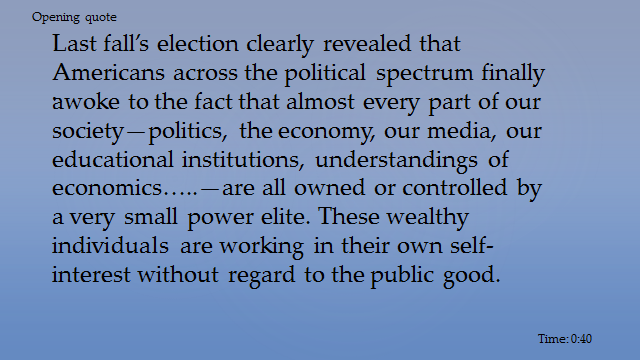 Big Money Influencing Politics: How Can We Stop It?  This sermon, “Big Money Influencing Politics: How Can We Stop It?,” was originally delivered to the congregation of Harmony, a Unitarian Universalist Community, on May 7, 2017. It is published here with permission from the writer, with all rights reserved. This is the expanded text of the sermon on the corrupting influence of big money influencing politics, had there been much more time. It’s important to understand the problem before we can change it. 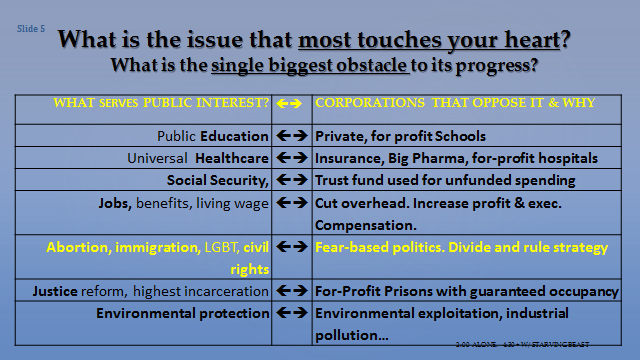 Even in this expanded form, we are only covering the problem itself while barely touching on how to fix it. That will have to come another time—hopefully in a 3-4 session study group. So…why are we here today? Polls show that most Americans already agree the corrupting influence of Big $$$ is perhaps the #1 problem we face as a nation. As a child, I remember Dad’s stories of the selfish and underhanded methods being used acquire extreme wealth. As an adult, it again came into focus in the early 1980s. 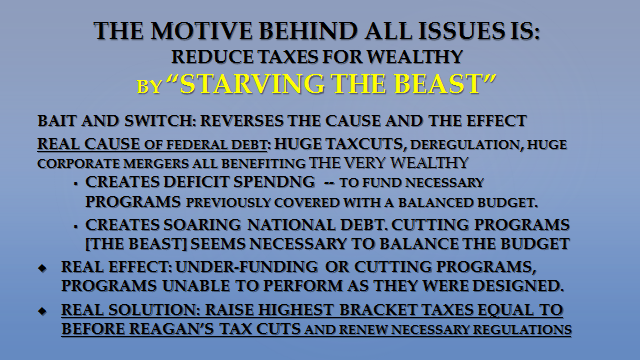 This is when Reagan cut the highest tax rates which began a process of consolidation of wealth and power we see today. How this happened is what we will explore today. A year or so after the tax breaks, Dan Rather reported that the Congressional Budget Office did a study on how that tax give-back – amounting to $ millions each for those at the top – was actually spent. Anybody want to guess? The highest amount was spent on blatantly selfish conspicuous consumption: second and third homes, personal planes, yachts, exclusive country club memberships… all extreme luxury items. This did almost nothing for the economy. Guess what item number 2 was? They invested it in foreign businesses. The direct result, Dan Rather said, cost both American jobs which caused huge loss of tax revenue which had been funding governmental programs since WWII without increasing the national debt. Now guess what was the lowest category on the list? Reinvestment in American business and industries. That’s not speculation or personal opinion. Those were hard numbers objectively produced by our own government. These empty far right promises bit us twice and still too many Americans have yet to understand. “Trickle-down economics” did the exact opposite of what was promised and has ever since. This was the start of the downward spiral towards what we see today. How could this not be a major concern for all of us? Ever since then, it has been clear that achieving results on any of our progressive issues revolve around the corrupting influence of Big $$$. Without ending the massive power of the top 0.5%, we are not going to get very far on any of our concerns, will we? So where are we today? 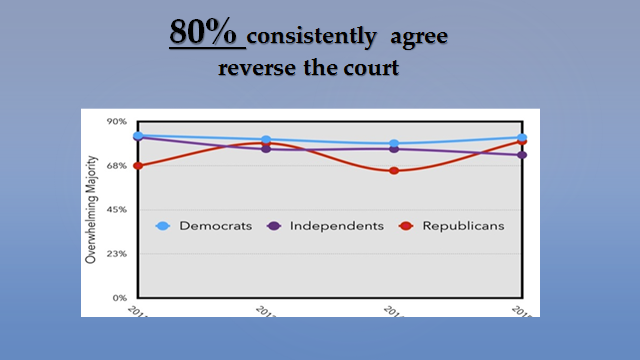 Supreme Court rulings purport to allow self-serving private interests …to spend unlimited money…from unknown sources… with absolutely no accountability to the will of the voters, …candidates, … or political parties, … to gain broad control over the media message … virtually shaping public opinion,… with little or no regard for the truth or the public good, …and thus imposing their will on our government and the American people. Isn’t this an accurate description of how our country works?,… and needs to be fixed? …now rather than later? Looking back further in history, it took the Great Depression to break the ruthless power of a small minority of society called “robber barons.” Since the early 1800s they had been consolidating wealth and shamelessly controlled almost everything including our government. Especially their treatment of labor was brutal; damaged and lost lives meant little or nothing and profit meant everything. In the next 20 years coming out of the Depression, the distribution of power and wealth began to change. The government worked for the people, not just those at the top: Laws and regulations were put in place to prevent abusive practices particularly by financial institutions, and to win fair labor practices, elimination of child labor, anti-trust laws just to name a few. These reforms were the foundation supporting the growth that followed the Depression and WW II. For the most part, post WW II was a boom time. The middle class was growing quickly. One income family could afford a home, car, good education, health care, and a secure job with growing benefits… People were working hard because they knew they were getting their fair share of the wealth they helped create. We had every reason to be optimistic about our economic future. Then it changed and as we will see, it changed by design. Right after WW II, the highest tax rate had reached as high as 94%. That tax revenue was substantially responsible for the ‘50s boom time paying for massive infrastructure projects which created the base for the growth in shared prosperity. Then we hit a snag: Issues we couldn’t foresee or control – the Iranian revolution and resulting energy crisis – immediately caused a major recession, hyper-inflation, loss of American jobs… The arch conservatives saw their opportunity to regain the hold on the American economy they had lost during the Depression. Their story line went like this: Obviously, they said, all of this was caused by over taxation and regulation. We needed to turn the economy back to private interests, the “job creators” regulated only by free market, supply and demand, and profits to make our country financially great again. And America bought it. This change began in earnest when Ronald Reagan came into office in 1980 and immediately cut the highest tax rate from the then current rate of 70% to 35%—in half—and then again to 28%. Their claim was that this tax cut would be re-invested in our economy creating new, high-paying jobs. It was known as “trickle down” economics and history has proved that it never worked. Things began to be turned up-side-down. How did all this growing power for those at the top come to be? By three things: income, ownership and power. Let’s take a look. 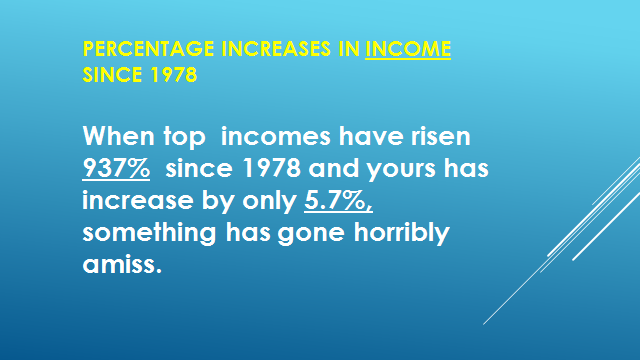 What has happened to incomes since the huge tax reductions? The first result is no real surprise. The tax reductions went in dribs and drabs to the bottom 80% while the vast majority went to the very top. It has been called the biggest “reverse Robin Hood” in history. Of course there were other issues serving their selfish interests like getting rid of those expensive regulations that kept them from despoiling the environment, removing financial regulations in the Glass-Steagall and Antitrust Acts, etc. – the very things that protected us from the re-emerging Robber Barons for half a century. It’s all part of the same picture. Now regarding ownership. Again, this should not be any surprise. With the tax rebates amounting to many $ Millions each, what did those at the top do? They promptly used it to buy almost everything of value in our country. The 5% at the very top now own 72% of all our nation’s wealth – our factories, hospitals, financial institutions and anything that is financed, meaning our homes, cars… This is while the 80% of us at the bottom – and we note that 80% is a pretty big bottom – own a mere 7% of everything in America. 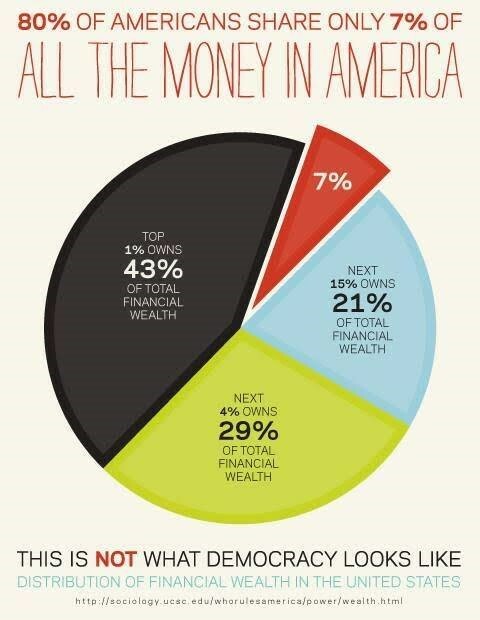 The ownership that results from the skyrocketing disparity in income is simply the logical conclusion. Any question that if they have the money and the ownership that they have the power to go with it? Everything that had been working so well for half a century got turned up-side-down again. What’s behind all this? While there are many ways to answer this question, don’t they all revolve around the corrupting influence of big money we have been exploring. Maybe it’s carefully hidden underneath the surface where it cannot be directly seen, but any real question that it’s there?… that many wealthy people and their corporations become abusive, greedy, and no longer serve the public interests? But that’s only the very beginning and the national debt clearly illustrates what really happened. Understanding this chart is very important to understand what really went wrong with our country. Before we entered WW II, the national debt was only half a $ trillion even after all the public works and other programs that were so responsible for pulling us out of the Depression. So the difference between that and the next $1.5 trillion was mostly due to the expense of war. 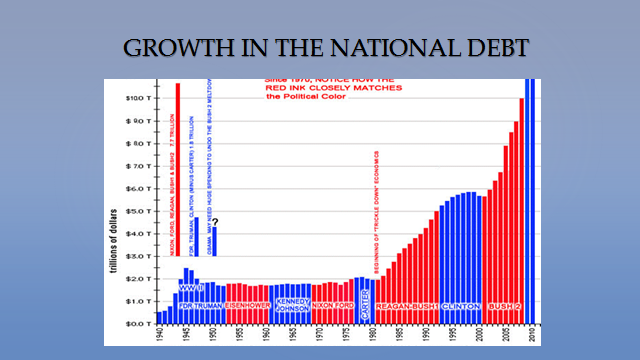 Except for a little bump during WW II for the next 35 years the national debt stayed constant just under $2 trillion despite funding all the infrastructure improvements and government programs that served the people well,…all without increasing the national debt. Remember as we look into the next steps, the programs were all already there and working well supporting our common good. But then we come to 1980 and the national debt skyrocketed. What else happened just then? Why did that happen so quickly? Oh right! That was when Ronald Reagan came into office he immediately cut the highest tax rate from 70% to 28%. If you do the numbers, that removed about $2 Trillion from federal tax revenue. And that was the beginning of the soaring National Debt. Just in case you think I’m exaggerating this, take some time to examine the following tax table. Look at the top line: 400 individuals make $87 million taxable income. They don’t tell us that. What they tell us is that they pay $20 million in taxes. “Wow,” we say. “How can that be fair? And look how generous they are; they spend millions to build universities, libraries, art museums and theaters.” Remember: just before this our government provided all those things in the public interest. Now the wealthy do some of this with the wealth they used to pay in taxes – after they took a huge chunk of it for themselves. Do we ever stop to ask if this is really a description of generosity? And then what they don’t say is that they have $67 million after tax income, year after year. I’ll bet you could find a few million here and there for charity if you had their income. Oh, yes, and a few $million here and there to put in the campaign funds just before a vote which you favor or oppose. But that’s free speech and doesn’t affect the vote and it’s definitely not a bribe. Right? Our understanding needs to go deeper. Unfortunately, the world has changed and it changed by design. 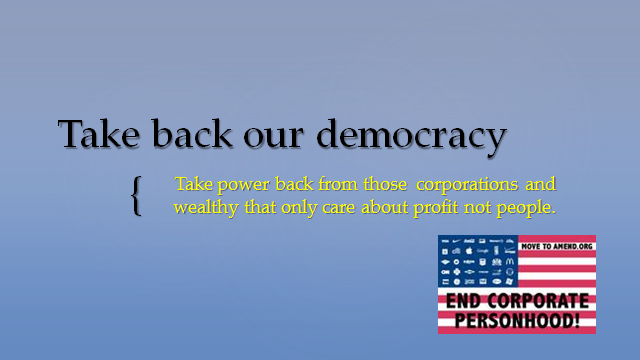 The pre-Depression robber barons never accepted their loss of privilege and power. After years of planning behind closed door in conservative think tanks, they created a plan – a real plan that can be documented and studied. They named it “Starving the Beast.” The “beast” is the federal government which had “stolen” what they consider their own. Their goals were to decrease their taxes and regulations to increase their income, ownership and power – at which they have been highly successful. The capstone of their plan was to make programs unable to perform the function they were created for. This created failure “proved” Reagan’s most famous quote: “Government IS the problem” which at this point appeared to be objectively true. The world stood on its head. We were conned into mistrusting our government because by design they had made it fail. What they did not say was that those at the very bottom got a couple of hundred dollars a year. Those earning over $100,000 actually got a few $ thousand – enough for each group to see it as helpful. What they did not say was that those at the very top literally got $ millions. And it’s still working. Americans still elect conservatives who continue this path. Even now their only answers to our current problems has been more tax cuts for the “job creators” (BS—remember Rather’s report?) and cut even more government programs and regulation. These are the only strategies in their playbook. It appears that Americans are finally beginning to see that they don’t work in the real world. And yet those in control keep following the same old path. To change this, they would have to admit their theories are just plain wrong. We’ve been conned. Is there yet any hope? You bet. There’s truth in the expression: It’s darkest before the dawn. What did the last election show us? This is the year that Americans finally awoke to the fact that almost every part of our society – politics, the economy, our media, our educational institutions, understandings of economics… all are owned or controlled by very small power elite working in their own self-interest without regard to the public good. In frustration and anger, Americans have rejected the political status quo. The problem is not government, but government controlled by the very wealthy. Americans have actually known this for some time as polls show. 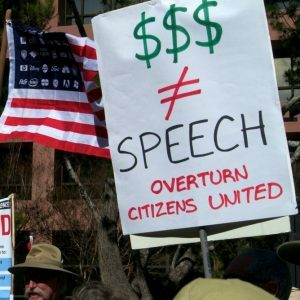 Ever since the 2010 Citizens United Supreme Court decision the polls have consistently revealed that – across the political spectrum – 80% of all Americans have opposed the growing power of the 0.1% at the very top. We need to turn it into a heart issue. For the most part, we will leave this slide up to you to explore and understand. For every issue that concerns us, there’s an undercurrent of greed and power which opposes needed progress. This is fairly easy to discern if we are paying attention and asking the right questions. But what about abortion, immigration, LGBT, civil and human rights? What stake does Big $$$ have in these issues? It has no apparent relationship to their own monetary interests. These issues are what are called the “hot button” issues – very emotional and based on strong beliefs that differ from left to right. What we see here is the strategy of “divide and rule” and it’s been used by despots to control populations at large for as long as human history. It is particularly important because it touches essentially everything else. Why is this so important? How is this used as a tool to maintain their own control? Here’s how it works: If I’m on the social, political or religious right and you’re on the left and we’re fighting each other,… guess what’s happening over on the side? They’re robbing us blind. And that’s what’s happening right now. And what is the energy that drives the divisions between the majority of Americans? The politics of fear, prejudice and hatred. While none of this is consciously intended by most people even among the rich and powerful, it definitely is among that small, inner group that came up with starving the beast so that they can own and control our nation. We have all the power we need right now through our votes. We, and we alone, choose those who will represent us every time we vote. They are the ones who create the laws and policies determine the details how things work. They determine tax rates and what regulations we need to protect the common welfare. So, the answer is simple: We’re going to turn them around, or we’re going to turn them out. And what is the determining factor in choosing our representatives? Big $$$. Let them take huge contributions to their campaign funds and produce the attack ads we know they will. Seen for what they really are is the proof of who we should not listen to,… not vote for. The difference is clear if we can get Americans to see what is before their very eyes. If we require that they publicly declare they support taking Big $$$ out of politics and they refuse, we know they don’t get our votes. For this simple strategy to work, we need to determine the single best solution we can all agree on, and then ask the straight up: Are you for it or are you against it? The strategy is simple and it can work. It’s called making Big $$$ the poison pill: If you take the Big $$$, your political career is dead. Virtually everyone working on this issue agree to fundamentally change how our government works will require a Constitutional Amendment. Amendments were designed to be difficult as a protection against whimsical decisions which will determine the course of our government for a very long time. That is why our founding fathers decided to require a 2/3rds vote of Congress and ratification by 3/4th of the states. We believe the best resolution currently before the Congress is Move to Amend’s “We the People Amendment,” House Joint Resolution [HJR]48, because it is the most comprehensive. We will only get one chance at this so we need to be sure that it forms the foundation needed to solve the whole problem of stopping the corrupting influence of Big $$$ we face. 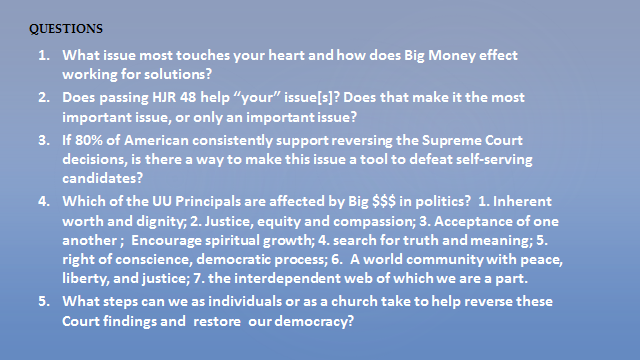 Yes, we still need to work on the other issues that touch our hearts, but the best plan we’ve seen is that we should make ending the corrupting influence of Big Money influencing politics our #2 issue. Why? Because in tying our #1 and #2 issues together we are supporting the necessary change for all the issues that concern us. And if this is not worth our concern and effort? Well, that’s why we have the government, society and economy that we do. Our government is only as good as we make it be. Where to we start? We have a list of simple acts that only take a few minutes each which anyone can do anytime at home and even in your jammies. We also hope you will go to www.movetoamend.org to sign their petition supporting the amendment and see other steps you can take. What other issue can have such a wide-spread impact? We hope this is important enough to do at least this much.